You’re probably not the type of person who judges someone on the basis of their appearance, but admit it – when you meet someone who has broken, discolored teeth, you may turn away or form an unfavorable opinion instinctively. We respond to beauty and we recoil from ugliness – it is just human behavior. Of course we get over it, but still, it is there. And of course you want to make the best possible impression on the people you meet, so if you have a discolored smile, chances are that you would like to take measures to correct it. Dr. Eric Spellman can help you do just that. For superior teeth whitening results, Dr. Eric Spellman offers custom take home trays. You have probably seen any number of advertisements for teeth whitening products. As a matter of fact, you’ve also probably seen some of those products in your favorite grocery or drug store. Although these products are a bargain, the fact is, some of those whitening products that you find deeply discounted at your local store or bargain website, aren’t all that good for your teeth. If you want effective, safe teeth whitening, your best course of action is to consult your dentist. That’s because you can be sure that a dentist will never suggest that you use anything harmful, and also because dentists can offer whitening treatments that deliver results far superior to over-the-counter methods. Dr. Eric Spellman recommends Sinsational Smile or Opalescence® whitening treatments for his patients in Larchmont who do not have the time or patience to wear custom trays. It is the brand most preferred by dentists, and you can have the treatment done in-office. Sinsational Smile® uses effective technology that works in 20 minutes with the use of pre-filled silicone trays. This in-office treatment allows patients to whiten their teeth in comfort with a relaxed jaw. This treatment is economical and will usually give several shades of whitening. This product is designed for people who quickly want to brighten their smile and usually repeat this process twice a year after every cleaning to prevent fadeback. Opalescence Xtra® Boost is an in-office treatment that contains a 38% hydrogen peroxide solution. The treatment takes about 60 minutes, and you can expect a slightly brighter result than Sinsational Smile but the process takes longer. 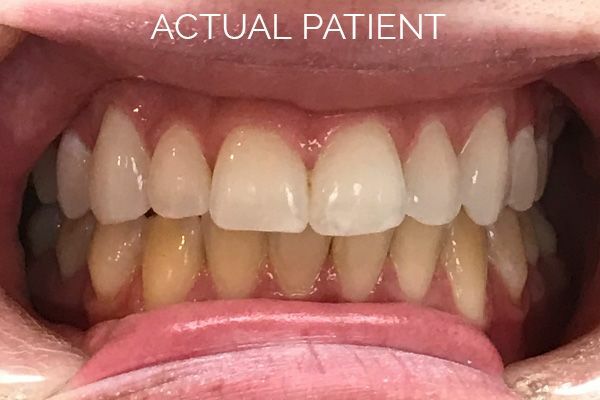 If you’re dissatisfied with yellowish or otherwise discolored teeth, in home custom fabricated trays, Sinsational Smile® or Opalescence® whitening treatments can help to improve your smile. Dr. Eric Spellman can help patients in the Larchmont area to get the dazzling smile they want and deserve with Sinsational Smile® and Opalescence® treatments in office. Don’t settle for lackluster teeth when you can benefit from the best whitening treatment on the market today. Call Dr. Spellman at 914-618-3400 to get the bright smile you want.